By John Kruzel on Sunday, March 24th, 2019 at 5:13 p.m.
After a nearly two-year investigation, Special Counsel Robert Mueller delivered to the attorney general his findings on Russia’s interference in the 2016 election and whether the Trump campaign coordinated with Moscow. Attorney General William Barr’s summary of the report is now public. Mueller’s probe leveled nearly 200 criminal charges against 37 people and entities, including charges or convictions of six associates of Donald Trump. Notably, Mueller did not indict Trump, his campaign or any other Americans for conspiring with the Kremlin. There is intense pressure for Mueller’s report to be released in its entirety. But in the meantime, here are some of the questions the Justice Department synopsis answers — as well as some questions that the summary leaves unresolved. Did the Trump campaign conspire with Russia? No, the Mueller report did not find such coordination occurred, according to Barr. Here, Barr quoted the Mueller report directly: "(T)he investigation did not establish that members of the Trump campaign conspired or coordinated with the Russian government in its election interference activities." Barr’s letter described how the special counsel’s office defined coordination, which appears to encompass a broader range of conduct than conspiracy. "In assessing potential conspiracy charges, the special counsel also considered whether members of the Trump campaign ‘coordinated’ with Russian election interference activities," Barr wrote. "The special counsel defined ‘coordination’ as an ‘agreement—tacit or express—between the Trump campaign and the Russian government on election interference.’ "
One important caveat is that it’s not clear from Barr’s letter what level of evidence Mueller’s office considered — for instance, the beyond-a-reasonable-doubt standard that’s applied to criminal prosecutions, or some lower bar. But the bottom line is Mueller’s team — according to Barr — did not find conspiracy or coordination between the Trump campaign and Russia in its election interference activities. Mueller did not take a position on this question. "The special counsel did not (...) draw a conclusion — one way or the other — as to whether the examined conduct constituted obstruction," Barr’s letter stated. 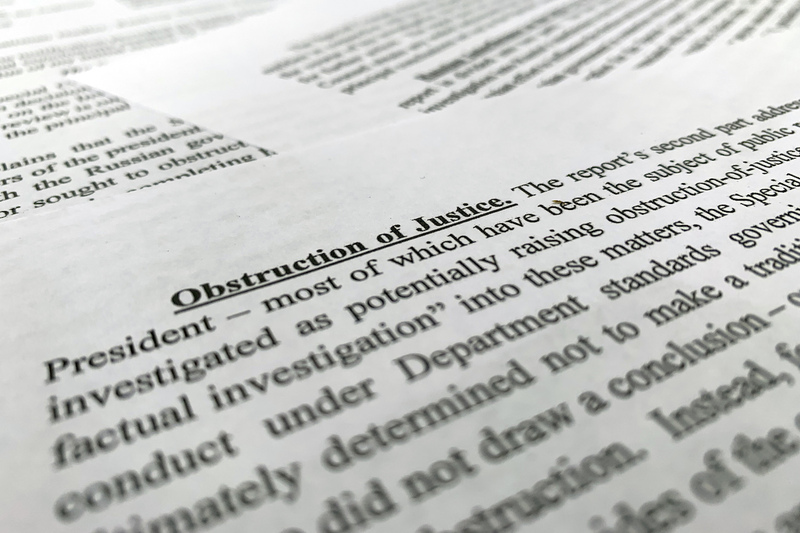 Barr noted that the special counsel left unresolved "difficult issues" of law and fact as to whether Trump's actions and intent amounted to obstruction. However, in his discussion of obstruction, Barr noted that Mueller’s findings did not clear Trump, either. "The special counsel states that 'while this report does not conclude that the president committed a crime, it also does not exonerate him,' " reads Barr’s letter, quoting Mueller. Separately, Barr and Deputy Attorney General Rod Rosenstein concluded that Mueller's findings were not sufficient to establish that Trump obstructed justice. They noted that the fact that Trump wasn't involved in conspiring with Russia was a factor in reaching the conclusion that Trump did not obstruct justice. Does Mueller’s report exonerate Trump? According to Barr, it largely does — at least on the collusion front. Mueller did not establish a conspiracy. For the White House and Trump’s supporters, this will be seen as an unmitigated win. White House press secretary Sarah Sanders was also quick to capitalize on Barr’s summary. "The Special Counsel did not find any collusion and did not find any obstruction," she tweeted. "AG Barr and DAG Rosenstein further determined there was no obstruction. The findings of the Department of Justice are a total and complete exoneration of the President of the United States." But Sanders overstated Mueller’s finding on the issue of obstruction of justice. He left the question unresolved (and said explicitly his findings didn't exonerate Trump). But Barr and Rosenstein say no obstruction occurred. Ned Price, a former U.S. intelligence official and an outspoken Trump critic, said broader questions about Trump’s possible conflicts of interest were not addressed. For example, Trump’s former lawyer Michael Cohen has said negotiations over building a Trump Tower in Moscow continued longer into the 2016 campaign than Trump and his associates have claimed. Separately, Cohen has also accused Trump of engaging in a campaign finance violation involving alleged former mistresses. But on the Russia collusion front — which has nagged Trump over the course of his presidency — the special counsel has said, in effect, that neither Trump or his Trump campaign provably engaged in a crime.